The five tables you need to join together! 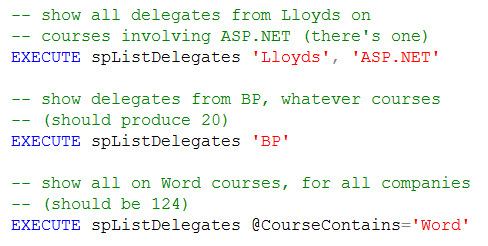 Create a stored procedure called spListDelegates which displays, for a given company name and course name extract, the people who are attending courses. If you leave either of the two parameters out, your stored procedure should show all rows for that parameter. These calls to your procedure should return 1 (if you're looking for an exact company name match), 20 and 124 delegates respectively. Optionally, save the query to generate your stored procedure as Delegates for course and company.sql, then close it down.